. إن 58 On Cron Motel حريص على توفير الراحة للنزلاء، فلا يوفر الموظفون جهداً في تقديم أفضل الخدمات وضمان حسن الاستقبال. إن مرافق مخصصة لذوي الاحتياجات الخاصة, واي فاي في المناطق العامة, صف السيارات, جولات, مكان مخصص للتدخين هي جزء فقط من الخدمات التي تميز 58 On Cron Motel عن باقي الفنادق في المدينة. يمكن للنزلاء الاختيار من ضمن مجموعة من الغرف المصممة بعناية لتعكس جواً من الراحة، والتي يتجاوز عددها 16. يمكنك الاستمتاع بالأجواء المريحة التي تقدمها حديقة طوال النهار. إن كنت تتطلع إلى إقامة مريحة وهادئة في فرانس جوزيف جلاسييه، فستجد في 58 On Cron Motel بيتك الثاني. يُرجى العلم بأن اتصال الإنترنت في الغرف يكون عبر الواي فاي. تكون أول 50 ميجا بايت في الليلة مجانية، وبعدها تنطبق الرسوم. We recently stayed one night in the two bedroom unit here. The cleanliness was very poor. On arrival we found crumbs and pieces of biscuit under the dining table. Some items of crockery in the cupboard were dirty, there were dead insects in the windows, the kettle was grimy and dirty on the outside and the curtains were quite shabby and dirty. We do not mind a place being old and dated but there is no excuse for it not to be clean. We had travelled around the South Island and stayed in 9 other places of accommodation and this one was by far the worst. Easy to find, plenty of parking and easy walk into the little town that has a few bars and restaurants. We went to the one at the end of the road past the petrol station. It was good. Wifi at the hotel was virtually non-existent. Understandable, maybe, in that area but staff did not seem in the slightest concerned - almost found it funny. We only stayed for a night. Easy check in & good location. But pls give yourself a favour and wash the cups and cutlery before you use it. Food splattered in the microwave, it was so dirty that I can’t even use it for my heat pad. Of all the places we’ve stayed in on our trip on the South Island this one stands out because the owner could not have been more helpful. From making phone calls to supplying towels for us to use at the hot pools across the road( so we didn’t have wet towels to travel with), nothing was too much. 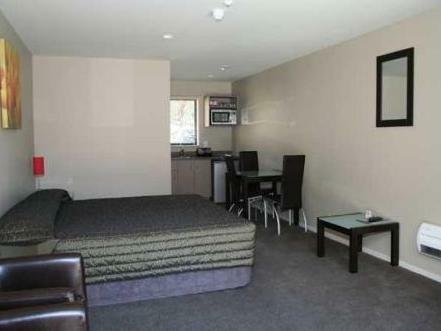 Room is big and clean with a well equipped kitchenette. The room is also scented with nice smell upon entry to the room, good effort from the staffs who do the cleaning! Receptionist is also helpful in providing recommendation on where for a meal. 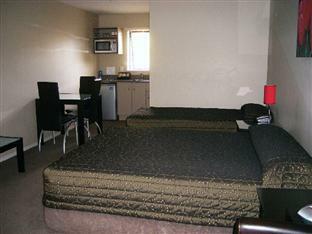 Motel location is just few minutes walk away to the main town area and right opposite the hot pool. Laundry can be done in the motel at a cost but only at specific timing. It is a very clean and spacious place to stay. Since the town itself is just two streets, any place you stay in is a convenient location. The staff is very pleasant and friendly, appreciate the free milk upon check in. The room is well kept, complete with cooking amenities. Very pleasant and enjoyable stay. We booked a studio room for 3 people and it was clean and beautifully furnished. Had the basics we needed for an overnight stay. 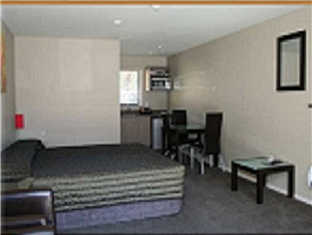 Conveniently located across from Franz Joseph Glaciers guide center and hot pools. 4 Square was only a short 5 mins drive away. Had beautiful scenery. Friendly staff and easy communication. Would recommend. Lovely place to stay. Came here to do glacier walk, unfortunately the weather closed in and we were unable to leave our room for a long period of time. Couldn't have wished for better accommodation. Spotlessly clean, right accross the road from the spa pools which were a delight. Had light cooking facilities. Very enjoyable stay. Great location, modern and clean. After umming and arring about several places I settled on 58 On Cron and wasn’t disappointed. 50 tv Chanel’s, free WiFi, and just short walk to the main eateries made it easy with the kids. Modern, clean and warm rooms like it was built only yesterday. Highly recommend. Great location, close walk to all shops and services. The most friendly and helpful staff. Clean and comfortable room, handy to have a well equipped kitchen but there are lots of nice restaurants and cafes close by. Pros Clean and tidy. Friendly staff. 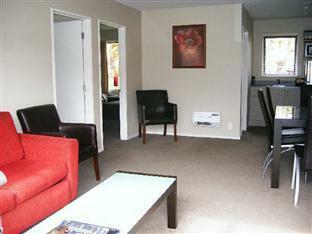 Convenient to restaurants and attractions in Franz Josef. Two gas BBQs available to use. Sky TV in the rooms. Only noise was from other guests with loud motorbikes leaving in the morning otherwise quiet setting. Cons Bed was a bit soft. It's clean and comfortable, and it's easy to stay for a day or so. The owner is a man of businesslike manner. the location of the hotel is great, walking distance to restaurants and shops. The room is clean and comfortable, the kitchen facilities is complete too. The stuff is very friendly and helpful. Decent, clean motel right across from hot springs. Staff at front desk were very helpful. Only downside was that the bed was very soft, and wifi very poor. The hotel is nice. 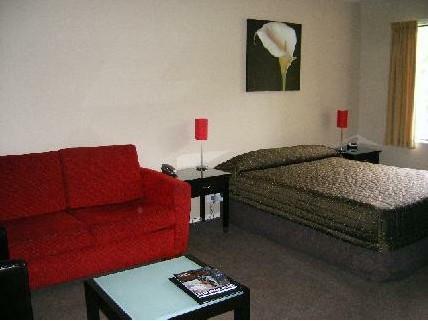 We have one room with one doublebed and one single bed. So you can fit 3 people in the room. The room has kitchen (with stove, microwave, refrigerator). The wifi is poor. But the TV is OK. The hotel also provide laundromat for use (in the laundry room) and iron in each room. The staff is very nice and very helpful. 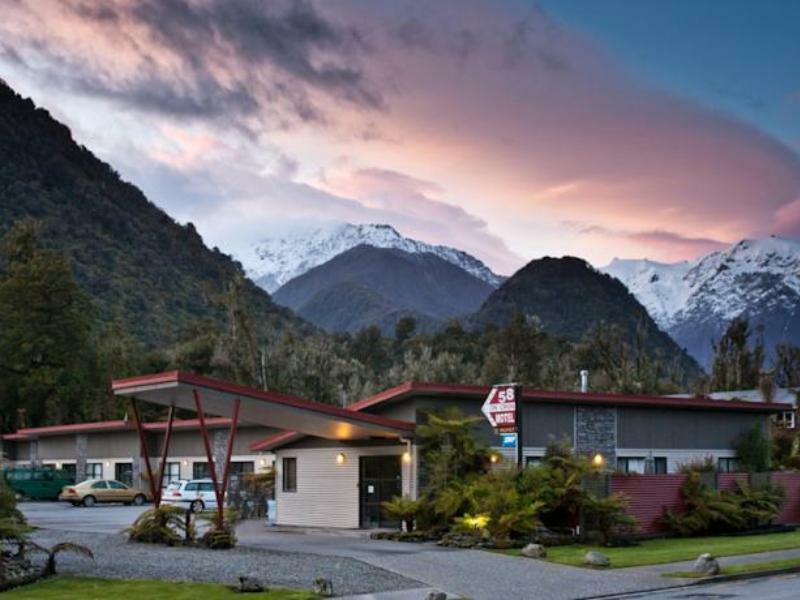 Only a one night stay to experience Franz Josef Glacier. Unfortunately the weather didn't cooperate and our planned activity was cancelled -- not the hotel's fault. The room was quite new & fresh. Everything worked and it was comfortable. The person who worked on the front desk was helpful suggesting places to eat (not that it was difficult, just up or down the road, but it's nice to get some input from a local). Our itinerary only allowed one night here. based on merit alone I would go back. The hotel & staff were good. Great communication with the very nice owner in advance and during our stay, very helpful and caring that our stay will be perfect. Great location, close to everything, hot pools across the street, We got towels for them at the motel, as well as a map and explanation of Fox Glacier town for our drive to the south. Very nice rooms. Located across the road from the Franz glacier guides, it was easy to just walk across the road to get to the hot pools and back. I was greeted warmly upon check-in and was given useful information about the area. We were guided to our room and was pleasantly surprised by the quality and cleanliness of the room. It was even better than some other hotel rooms I've been to!